Nation-Building in Syria – Or Nation-Wrecking? 19 February, 2018 (RT)* — Over the past few days, a controversy has been in raging over what exactly happened near Deir ez-Zor in eastern Syria. **Photo: Hasakeh: US Armored Vehicles Spreading In Direk Town 1-5-2017 | Qasioun News Agency | Creative Commons Attribution 3.0 Unported license. 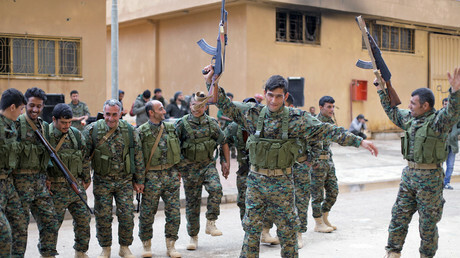 To hear the US tell it, “pro-regime” forces launched an “unprovoked attack” on a “well-established” headquarters of the “Syrian Democratic Forces” (SDF), among whom were US personnel. (One denizen of the fever swamps assures us the attack was for the purpose of killing Americans and was approved personally by Russian President Vladimir Putin!). To hear Russia and pro-Russian sources tell it, Syrian government and pro-government militia were fighting off an SDF and ISIS joint attack when they were hit by American air power, killing an unknown number of Syrians and perhaps five Russian private military contractors. Reports of higher numbers are “a classic example of disinformation,” according to Moscow, and were first peddled by sources close to anti-government jihadists, then picked up by Western media. 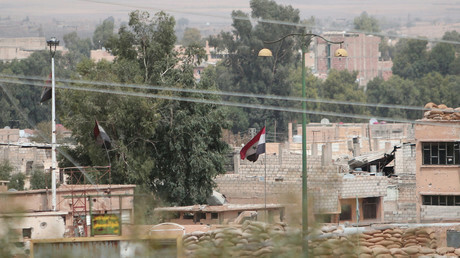 Whatever the real story is, one thing is clear: the US is hunkering down in Syria to stay. It isn’t to defeat ISIS, the destruction of which was the sole reason the US needed to be involved in Syria, then-candidate Donald Trump said during the 2016 campaign. Even that mission would not make the presence of American forces there legal, but at least it’s some kind of explanation. Last summer, Trump was weighing plans to send more soldiers to Afghanistan and was contemplating the military’s request for more-aggressive measures to target Islamic State (IS, formerly ISIS) affiliates in North Africa. In a meeting with his top national security aides, the president grew frustrated. That was about Afghanistan, where Trump stifled what he admits was his own instinct to get out and instead allowed the “professionals” to talk him into doubling down on the same policy that has failed for the past 17 years. It seems that Syria fits the same pattern. The permanence of the intended US presence in Syria was signaled recently by Secretary of State Rex Tillerson. Speaking at a meeting in Kuwait at a meeting of the global coalition fighting against ISIS – a coalition that includes neither Russia, nor Iran, nor Syria itself! – Tillerson pledged $200 million for aid in rebuilding Syria as well as aid for Iraq. Evidently, it’s only nation-building at home that isn’t a priority. Some America First! There are a couple of catches to promises of all this largesse, though. First, Tillerson is promising only loan guarantees, not direct aid. Second and more importantly, there’s no indication that any aid would be available to areas liberated from ISIS and other, mainly Al-Qaeda linked jihadist groups, by the Syrian Army and its allies. Quite to the contrary, government-held areas are under crushing sanctions, which Tillerson gave no indication of relaxing. We mustn’t forget: Assad must go! In Syria, as in Afghanistan, Trump has become a hostage to the very policies he denounced during the campaign. We can speculate as to why that is, but there’s no doubt that it is the case. For whatever reason, Trump is now the hostage to the globalists and generals with whom he has surrounded himself. The looming big question is how bad it will get. The probable answer: a lot worse. That’s even though Mattis recently admitted that the US has no evidence of chemical weapons use by the Syrian government. Does that mean there will be a US apology for the cruise missile strike on a Syrian air base in April 2017? Of course not. But just a few days earlier, Mattis had warned of stern consequences against Damascus, telling the Syrians “they’d be ill-advised to go back to violating the chemical convention.” Did he only find out the Syrians maybe hadn’t used them after issuing his warning? Did he rescind his threat on making that discovery? Of course not. Q:Can I ask a quick follow up, just a clarification on what you’d said earlier about Syria and sarin gas?… Just make sure I heard you correctly, you’re saying you think it’s likely they have used it and you’re looking for the evidence? Is that what you said? SEC. MATTIS: No, I have not got the evidence, not specifically. I don’t have the evidence. What I’m saying is that other – that groups on the ground, NGOs, fighters on the ground have said that sarin has been used. So we are looking for evidence. I don’t have evidence, credible or uncredible. The only way Mattis’ contradictory comments can be read is as an open invitation for the jihadists fighting the Syrian government to stage yet another false flag chemical attack – and make sure this time it’s sarin, not mere chlorine. Washington has already decided where the blame will be placed. How this fits into any rational policy, much less the one Trump ran on, it anyone’s guess. Some suggest the real goal is chaos itself. It’s easier to wreck a nation than to build one. Any fool can figure out how to turn an aquarium into fish soup. No one has yet figured out how to reverse the process. 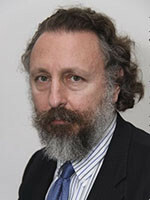 Jim Jatras is a former US diplomat (with service in the Office of Soviet Union Affairs during the Reagan administration) and was for many years a senior foreign policy adviser to the US Senate Republican leadership. *Jim Jatras is a Washington, DC-based attorney, political analyst, and media & government affairs specialist. Jim Jatras’ Op-Ed was published in RT. Go to Original.